Quelqu'un pourrait me dire comment on l'obtient ? cutest little pet ever!...... first post! Please give a warm welcome to your new happy hatchling! I'm so happy you could give this gorgeous little gryphon a home! Compared to the Wind Rider Cub, this one has an annoyingly stern look to it that makes it seem kind of.. nnh. For once I think the Wind Rider wins out to the usual awesomeness that is the Gryphon mount. Doesn't look like much effort went into the artistry of this poor little guy, but for once the Horde gets 'cute' and the Alliance gets.. uh.. something else. From a distance he almost looks less mean, though. 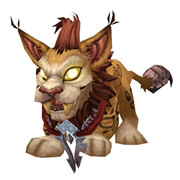 It should be noted that Horde characters can have this pet as well as Alliance characters can have the wyvern pet. does he have any slash commands? Yeah you're right! the wind rider cub has two little fangs and he has a happy look on his face! the gryphon has a grin on his face (eyes too!) as if he didn't want to be bought. just look at the difference. For those wondering, his vocalization (on click) is most likely a manipulated fisher cat or red fox cry. Had me boggling at what it was until I looked it up. the gryphon just looks kinda retarded. I saw nobody posted the price on the EU shop; it is 24.99 euros or 21.99 pounds and it includes the physical pet. Not specifically relevant to the in-game pet, but in case anyone's curious, the craftsmanship on the *plush* is amazing. The wings actually stick out, they're stitched tighter to hold their shape. There's a noticeable texture difference between the feather/fur plushiness and the beak/talons plushiness. So you're not getting a $25 pet and a cheap throwaway toy. This is a $25 stuffed animal. The Gryphon Hatchling is a unique companion pet, meaning that no other pet shares the same model. This pet walks to move, but will fly if the owner is on a flying mount. This pet can be obtained by purchasing a Gryphon Hatchling plush toy from the Blizzard store for $25. The in-game pet is given as a bonus with the plush toy. 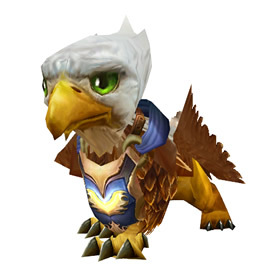 Once redeemed, the gryphon hatchling will be mailed to all characters on your account. Click here to see a video of this pet's basic animations + sounds. Cute little mini-pet, my boyfriend got it for me for Christmas and it came with the plush. This shares the same model of Jacasse, the little gryphon you have to find in Trouvez Jacasse. This at least helps to give you an idea. I also can say that the plush cuddly gryphon you get is very cute and soft. A copy of this pet is available through pet battles now: Jeune griffon marteau-hardi. This companion and the other from the plush range is currently available on eBay......things are looking up for pet collectors! These are super super cute! I had to purchase the plush toy from Blizzard to get the download code. The cuteness fact dawned on me. For those of you who don't have this pet yet, they are available at the blizzard US store again, though I am not sure if they will become available to the EU store or not yet. Hope this helps those in need of it since Blizzard removed them from the stores. Currently 12/03/2017 and for the past couple of weeks the Gryphon Plushie and the Wind Rider Cub have not been available in the Blizzard store. I have not heard whether or not it will be restocked. As of December 2017, this toy and the similar Bébé coursier du vent appear to no longer be sold in the Blizzard store. No word yet on whether either will reappear, so unfortunately these pets might be unobtainable for the forseeable future.